231k mirrorless, 676k DSLR shipped for March. For both types of cameras, the Q1 numbers for 2015 are down from 2014. Mirrorless ran at 86% of 2014, while DSLRs ran at 93% of 2014. Given Canon’s report yesterday of their DSLRs being down over 20%, that seems to indicate that Nikon did pretty well in Q1 with DSLRs (though I suspect there was a fair amount of dumping going on). We won’t know whether that was true or not until later in May when Nikon announces its annual earnings, which includes Q1 of 2015. But what strikes me is this: I’ve seen the pattern we’re seeing in Q1 shipment numbers before. CIPA forecasts for the year are higher than the numbers so far are achieving. But the pattern, I think, is that the manufacturers gave optimistic numbers for the forecast, then set manufacturing output to whatever they could tolerate below last year’s levels. If their optimistic forecast were correct, they could quickly crank up production. If the decline were to continue, they wouldn’t be as exposed with the lower levels of production. The fact that mirrorless lost energy is telling. ILCs in general just aren’t selling at rates they used to. All the discounting that’s going on (Sony has US$200 off the brand new A7II, Olympus has lots of discounts at the moment) tells us that demand is weak even at these lower shipment numbers. CIPA predicts 22m compact cameras shipped in 2015. I’m predicting that the number will be close to 20m, another 32% drop. CIPA predicts 13m ILC cameras in 2015. I’m predicting that the number will be close to 12m, which is a 13% drop from last year. ILCs, however, are far tougher to predict at the moment as we have quite a few significant ILC cameras being launched in the latter half of the year that might temporarily distort the numbers. 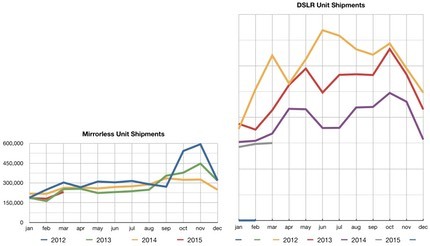 Curiously, lens shipments seem to be holding up better through the first quarter than cameras. Still, the first three months of this year haven’t been pleasant ones for the camera companies.